The lower Mustang is located at the north of the main Himalayan range, near Tibet. This region doesn’t see too many tourists. Passes in this area do not exceed the 4600m. It occupies the southern fringes of the Tibetan plateau and is dominated by Himalayan peaks such as Annapurna and Dhaulagiri. This is a classic and rewarding trail that takes us to the border of one most remote kingdom on Earth, within a reasonable time frame and without ascending to extreme altitude. Test of the moutain bike(s) around Kathmandu. 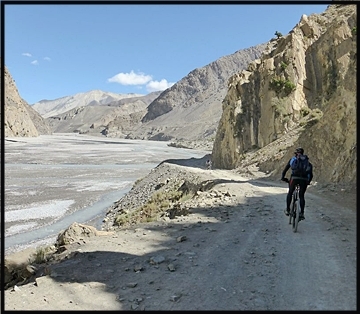 Flight from Pokhara to Jomsom, then ride until Muktinath. Tatopani - Beni, then transfer by bus to Pokhara. Starting from 900 US$ per person. Hotel in Kathmandu and Pokhara with breakfast(4 nights). All meals and accomodation during the trip.